Wet pour playground surfaces are extremely safe, and can be applied in a variety of colours, with almost unlimited design possibilities. Once applied wet pour is extremely durable, providing an attractive and dependable safe surface to protect children should they fall. Colourful, vibrant, cost-effective, with variable depths dependent on play apparatus height. 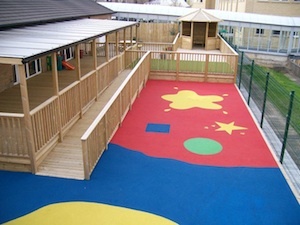 Wet pour surfaces look clean, professional, and they enhance a play area whilst providing a high level of safety.